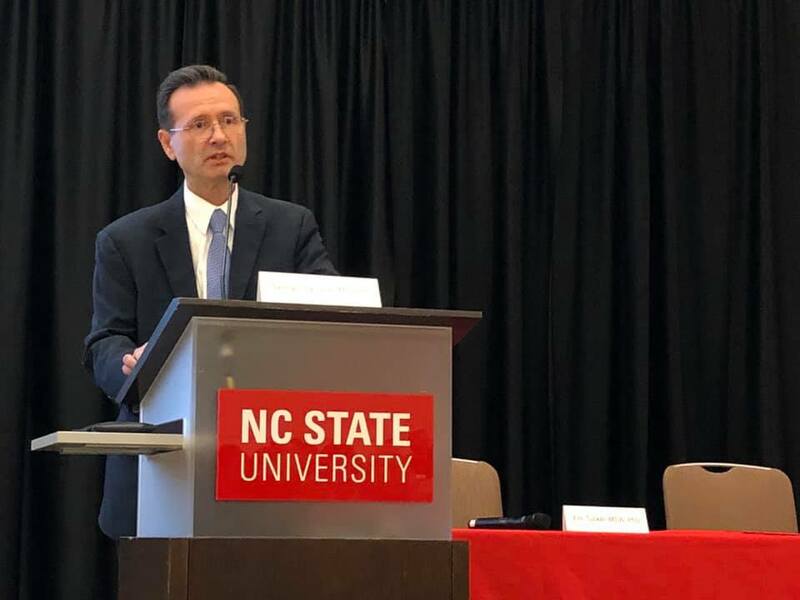 On March 5, 2019, NC State’s Department of Social Work hosted the 2019 Social Work Spring Summit: Integrated Behavioral Health for Medically Underserved and Rural Populations. The program was located in Talley Student Union and gathered a crowd of roughly 300 students, professionals, and speakers. The Summit exhibited an impressive line-up of professionals throughout the program. After a brief welcome and introduction by NC State’s Dr. Karen Bullock and Dr. Jodi Hall, keynote speaker Dr. George Sigounas, Administrator of HRSA, took the stage. Speaking on integrated healthcare and systems from a federal perspective, Dr. Sigounas explained several plans/models that aim to improve these systems. These included funding opportunities for integrated behavioral health services nationally, but included numerous opportunities for rural communities. Once Dr. Sigounas finished his keynote address, the summit moved onto the main panel for the day. The discussion centered on modern issues within Integrated Behavioral Systems for Medically Underserved and Rural Populations. The panel featured Dr. Luis Padilla, MD, FAAFP; Kody Kinsley, Deputy Director for Behavioral Health & Intellectual and Developmental Disabilities at DHHS; Hugh Tilson, JD, MPH, Director of the NC AHEC Program; Matt Sullivan, JD, MSW, Fire Chief for the town of Chapel Hill; and moderated by Eric Tucker, MSW, PhD, Lecturer at NC State Department of Social Work. Following the panel, summit attendees were given time for lunch, networking opportunities, and numerous breakout sessions. The breakout session’s topics and speakers can be found below. Prevention, “Understanding the Person First: An Alternative Lens for Integrated Healthcare,” with speaker Lauren Kestner, Harm Reduction Program Manager and Prevention Specialist at Center for Prevention Services. Medication Assisted Treatment for Substance Use Disorders, “Update on the Opioid Crisis and the Treatment of Opioid Use Disorder,” with speaker Andrew Muzyk, Pharm.D Adjunct Assistant Professor in the Duke Department of Psychiatry and Behavioral Sciences. Schools: K-12 and Higher Education (panel) with speakers Stephanie Helms Pickett, EdD, Associate Vice Provost for OIED, NC State University; Reuben Blackwell, CEO of OIC; Will Chavis, EdD, WCPSS Principal of the Year; and moderated by Dr. Edward Bell, Educational Consultant at EB Educational Services. Law Enforcement (panel) with speakers Captain Mark Bridgeman (Retired), President of NC Gang Investigators Association; Sarah Furman, Associate Director of NC State Violence Prevention and Threat Management Program; Sergeant Renae Lockhart, Youth Services Unit/Detective Division RPD; Jon-Paul Guarino, NCGIA/Gang Free NC; Alonzo Z. Jaynes, Police Chief for the town of Kinston; and moderated by Michelle Hodges Guarino, MSW, LCSW, NC State Senior Lecturer. Promoting Professional Placement in Rural Communities with speakers Maya J Sanders, MSW, MPH, Placement Services at the Office of Rural Health, NCDHHS; Brandi Burchett, LPCS, NCC, LCAS, CCS, ACS, CCTP, MAC, VP of Behavioral Health Services/Chief Behavioral Health Officer at CommWell Health; Sarah Chamber, LCSWA, Integrated Primary Care Behavioral Health Consultant at Charles Drew Community Health Center; Benita Dowdell, MSW Candidate May 2019, Joint Master of Social Work Program at UNCG/NC A&T, Field Placement: Charles Drew Community Health Center; and moderated by Alice Pollard, MSW, MSPH, Program Manager for Health Access, NC Community Health Center Association. Integration of Social Work and Primary Care, with speakers James Finch, MD, Changes By Choice, Medical Director, American Society of Addiction Medicine; Jane B. Finch, MSSW, LCSW, Changes By Choice. Sponsored by the Governor’s Institute. Harm Reduction, with speaker Jen Carroll, PhD, MPH, Elon University and North Carolina Harm Reduction Coalition. Older Adults, with speaker Sarah Maness-Smith, Adult Services Program Coordinator at North Carolina Department of Health and Human Services. Integrating Substance Use and Behavioral Health Treatment in Rural Communities, with speakers Avis Dublin, LCSW, LCAS, Program Manager at Johnston County Public Health Dept/BH Division; Freida Saylor, LCSW, LCAS, Director, Analensigi, Cherokee Indian Hospital Authority; Lorrie Meads, MSW, LCSW, Therapist at Albemarle Regional Hospital System/Behavioral Health; and moderated by Pam Wheeler, LCSW, MSW, Lecturer at NC State University. Intersectionality of Drug Laws, Gender, Race, and Class, with speaker Jessie Bennett, MSW Student and HRSA Scholar at NC State University. The Department of Social Work would like to thank all staff, faculty, alumni, speakers, sponsors, vendors, students, volunteers, and community members for taking part in our program. The program would have not been successful without the help of these individuals. Moving forward, the Planning Committee will take community feedback from our program with the goal of making next year’s program even better!